Exclusive Beach Colony is located on 11 acres of fabulous beachfront. The ingenious angular living room design transforms every residence into a Corner unit. 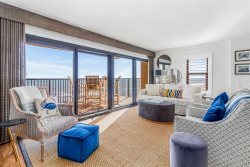 Wall-to-wall sliding doors and adjoining windows actually wrap around the living room, filling it with light, and revealing the panoramic beauty of the Gulf. The sweeping 300 SF terrace will be a favorite spot for quiet moments and lively gatherings alike. The uniquely situated Master Bath is a world unto itself. The whirlpool bath is surrounded by large, wrap-around windows, which can open to offer both a view and a feel of the hypnotic Gulf. This ground floor unit has a private balcony with gate access to a grassy area and great beach views. You're just steps to the pool deck--so convenient with little ones. It has 1683 SF of living area, tile throughout Living, Dining, Kitchen and Carpet in Bedrooms. Electronics include 42 in TV and DVD in Living Room, 32 in TV, DVD in Master Bedroom, 32 in TVs in each Guest Bedroom.. Besides the ease of booking this rental property, the check in process was equally an easy process. The location of this first floor condo was the best part of the condo. Ease to the pool and beach with small children were very important to our family. One recommendation would be to have electrical stitches in the master bedroom inspected. We did place a maintenance call for the dryer which was addressed within 24 hrs. We will recommend this condo and the rental company to our family and friends. Very pleased!! I have used Perdido Realty for several years. They are so friendly and helpful when I have questions. They make the overall experience amazing. Beach Colony Resorts was amazing. The indoor pool was nice since we had our grandchildren and the unit was perfect and the views were unbelievable. Our stay was very nice except for the fact that we had to leave early because of the hurricane. The staff handled our expedited departure very well. We LOVED the condo and the ease of beach accessibility. Beautiful facilities!